Save Time & Money By Reading THE END of This Article! 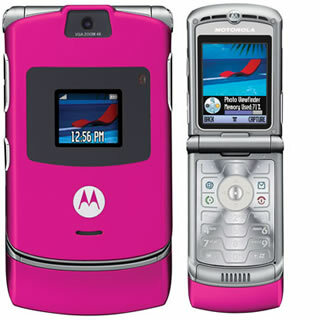 I recently purchased a brand new Motorola Razr v3 Pink for my wife for Christmas from Argos . Locked to the UK Vodafone Pay As You Go network, I wanted to unlock it so she could use it with her Orange PAYG sim card, because she gets 5 free texts a day forever, as long as the phone has credit on it. Thinking of myself as a bit handy at having a go at unlocking phones because I had previously unlocked my o2 XDA and my Orange spv c500 I thought I would have a go myself. There are several forums that show you how to do it manually using a mini USB connector, but the various warnings that you could ruin your cell phone if you got it wrong put me off. I then started looking at the other options. Some companies do imei unlocking when you don't have a cable, but that can take a couple of days, and I needed to do it before my wife got home from work! Needless to say, after 2 hours of trying to get it to work, turning off firewalls, re-booting, configuring my router, the motoblaze unlock software just wouldn't connect to their server. I tried Motorola Unlocker too, but that didn't work either. I'm not saying that this solution will not work for you, just not in my case. So then I did what I should have done in the first place. Phone Vodafone. I was on the line about 10 minutes and they were excellent. Make sure you've got your imei number and mobile number handy, and you'll need a non vodafone sim card to complete the process. For £19.99 they unlocked the phone, no hassle at all. The operator even stayed on the line while I hunted for a sim and entered the subsidy code to unlock the phone to any network. It couldn't have been easier. So the moral of this story is that if you want to unlock a Vodafone Pay As You Go (or one out of contract) Motorola RAZR V3, just phone the network provider, in my case Vodafone, pay your £20, and you will save yourself a lot of time and effort. Well done Vodafone! do you know anything about how to load new skins/themes into motorola v3 memory to change the screen apperances.